Mom’s Home Care School Inc., located in Leesburg, Virginia, was thrilled to be part of the National ECE Learning Collaborative in 2016 and continues to practice healthy eating and healthy celebrations to this day. After participating the collaborative, the program changed its policy on celebrations to ensure that all parties serve healthy foods. 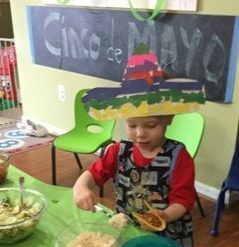 In addition, the foods provided during these celebrations are served family style so children can select what they want to eat from a menu of delicious and nutritious options. Maria Soldi, the principal of Mom’s Home Care School, makes her food from scratch and takes pride in using nutritious ingredients and creative recipes. When families want to bring food in to celebrate a birthday, Maria provides them with nutritious and fun recipes that children love such as Easter Bunnies made out of eggs, Jack-o-lantern snacks made out of oranges, birthday fruit kabobs, cheese stick snowmen and more. She researches and tries new food ideas, learning and growing alongside the children in her program. “Food has always been associated with holiday parties and celebrations in my program but it hasn’t always been healthy,” says Renate Zahn the owner of Renate Zahn Family Child Care Program in St. Louis, Missouri. Zahn discovered that many of the parties in her program included the usual cakes loaded with sugar and topped with tons of icing. Zahn’s goal was to incorporate healthy foods during celebrations that would keep the environment healthy and lively. Celebrating with students and staff is an important part of a school’s culture. But have you ever stopped to think about how many celebrations occur during the school year? Birthday parties, holiday celebrations, and school-wide events can add up quickly. Make sure that your celebrations reflect the same healthy messages you promote elsewhere throughout the school day.